While not a classic Western like The Searchers (1956) and The Wild Bunch (1969), Jeremiah Johnson has long been seen as a respectable contributor to the genre — and, so, the sort of film that is ideal to watch on Amazon Prime, particularly when you are snowed in (as we have been in the Philadelphia area). Set in the mid nineteenth century, its titular hero (Robert Redford, at his rugged best) is a veteran of the Mexican-American War, now determined to take leave of civilization. Armed with a rifle and a few provisions, he heads deep into the Rocky Mountains, hoping to “trap critters” and, in a gesture of Thoreauvian simplicity, to make do with what nature provides him. Yet, difficulties crop up from the start. Though impossibly beautiful — indeed, Jeremiah Johnson is a veritable ode to Utah, where it was shot — the mountains prove to be a severe environment. There are heavy snows, fierce bear and wolves, and the landscape seems to be littered with human corpses, whether victims of the elements or of violent men. Thus director Sydney Pollack quickly tempers the film’s romantic leanings: yes, the wilderness is resplendent, but it is also cruel, unforgiving. Johnson soon learns that, for better or worse, he has to rely on those whom he otherwise would avoid, namely, human beings. He picks up survival tips from an old trapper, and, through a series of unplanned events, he finds himself the patriarch of a small family — an adopted son, Caleb, and a Flathead squaw, Swan. They build a cabin in a valley, and each member of the family proves invaluable to the happiness of the whole. Here, it seems, is the human ideal, though, again, the film quickly retreats from any idealistic pretensions. For just as the family unit is a kind of culture, so does it find itself embedded in larger cultures. In this case, Johnson and his clan are caught between the needs of white settlers and the ancient customs of the Crow natives, whose territory surrounds him. He’d rather be left alone, but, even deep in the Rockies, the ways of men reign supreme. 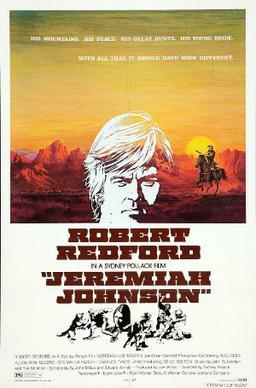 Ultimately, then, Jeremiah Johnson is a testimony to, if also a lamentation for, a postlapsarian world. We all have our ideals, it suggests, and we may even find friendship and love for a time. Yet, on this side of Eden (to put it in Christian terms, though one might just as well say “Utopia” or “El Dorado”), these are but fleeting realities. Johnson learns this lesson firsthand, and he soon (and somewhat controversially) lashes out at such injustice. As the movie ends, however, it is revealed that neither Johnson nor his ostensible enemies pursue violence as an end in itself. What they really want — what all human beings really want — is peace. Love your reviews! Your writing is so clear! Pretty random selection of movies though. Have you see HER yet? Many thanks! Yeah, a bit random, but the goal is simply to review any films that I see for the first time — even if they’re from 1972 (or 1932). Haven’t seen HER yet, but it’s on the list, along with several others (GRAND BUDAPEST HOTEL, 12 YEARS A SLAVE, etc. ).